How do I connect my wind farm to the Grid (electricity) network? Can you build your own grid connection? What are the options? What are the connection regulations involved? How can I find out if my site is close to the National Grid? Is there a national grid map? Do you need separate Planning Permission for your grid connection? My planned wind farm is in the Republic but my nearest transmission line in the North of Ireland. Is this a problem? Since December 2004 large scale commercial renewable generators ( i.e > 0.5 MW) wishing to connect to the transmission or distribution systems have been subject to group processing of connection applications through a series of successive “Gates”. Renewable generator applications are processed in a “Gate” system whereby all applications that have met the defined criteria are processed in one batch. Based on their level of interaction and geographic location, the applications within the Gate are divided into specific groups by the TSO and DSO for processing purposes. Within each group there are subgroups of applications. The system operators study the groups and assess their overall impact on the electrical system. The system operator then identifies the connection assets required for each group before connecting that group to the network. The IWEA however, would like to make those who are thinking about setting up a wind farm aware that unless you are already within the Gate processing system, there could be significant long term delays in getting connections through the current connection process. There is also a possibility of connecting a generator greater than 0.5 MW where you are what's term an"autoproducer". i.e where you install a generator which has a Maximum Export Capacity which is less than your Maximum Import Capacity e.g in the case of an large factory or industrial premises. The details on this may be read here. If a grid connection is identified as being contestable, this means that under the regulations, the developer has the option of building the grid connection at their own cost rather then paying the network operator to do so. The developer might decide to do this if they feel that they can build the connection cheaper and/or in a shorter time frame. Currently only the mainline transmission system operator (TSO) connections are contestable. The distribution system operator connections are not. In addition to the normal health and safety requirements for any manner of large scale construction, all connections have to be grid code compliant. The grid code is a technical document containing the rules governing the operation, maintenance and development of the transmission system and co-ordination of the actions of all users of the transmission system. Within the Grid Code, the planning code and the connection conditions sections outline the procedures and rules that must be followed regarding the planning of connections. This document can be download in its entirety, here. All regulations governing grid connections are contained in the grid code and its supporting documents. The code outlines a comprehensive list of requirements that must be met in order to be connected to the grid. The Grid Code states that "...For the protection of the Transmission System and Users’ Plant and Apparatus directly connected to the Transmission System, and in order to maintain, insofar as is possible by Good Industry Practice, stable and secure operation of the Transmission System for the benefit of all Users, it is necessary to require certain minimum technical, design and operational criteria to be met by Users’ Plant and Apparatus..."
The transmission system operator EirGrid in conjunction with SONI the systems operator in Northern Ireland have published an updated all-island transmission system map in October 2007 which may be downloaded here. The map shows the current status of the transmission grid. For viewing your local distribution network see here for the ROI and here for NI. Yes, separate planning is required for the construction of your grid connection. You will also need way leaves from the landowner(s) where necessary. It should be noted however that unless the connection is contestable, ESB networks are responsible for acquiring the necessary planning permission and way leaves. Contestability is the right of transmission connected generators to construct all or part of their grid connection to the transmission system. No, not necessarily, there are wind farms currently in operation which are planned and located in the Republic of Ireland but which are connected in the north of Ireland. 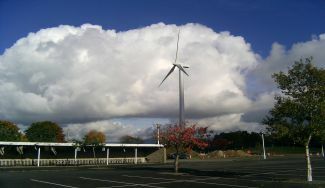 Airtricity's wind farm at Snugborough Co. Cavan was the first example of such an arrangement.